Italy – IOM is calling for swift action from the European Union following the worst tragedy in living memory involving migrants crossing the Mediterranean from north Africa. Up to 700 migrants are missing and feared drowned after the wooden fishing boat on which they were crammed, capsized near Libya as a cargo vessel was coming to its aid. By late Sunday night, one of the survivors was reported to have informed Italian authorities that there may have been up to 950 on board. IOM is asking the EU to once again support life-saving operations on the scale of the Italian run Mare Nostrum program shut down late last year on the grounds that it was encouraging irregular migrants to take to the seas. Ambassador Swing pointed to the success of the Task Force 120 that successfully got rid of Somali piracy as an example for the EU to follow in both saving lives and preventing criminal smuggling gangs from operating. The latest disaster occurred on Saturday night reportedly as a Portuguese cargo vessel was going to the migrants’ aid. It appeared that some 49 survivors had been rescued by Sunday morning and rescue operations carried out by the Italian Coast Guard, the Italian Navy, the Italian Guardia di Finanza, the Maltese Coast Guard and Navy continued throughout Sunday and were expected to continue into Monday and beyond. 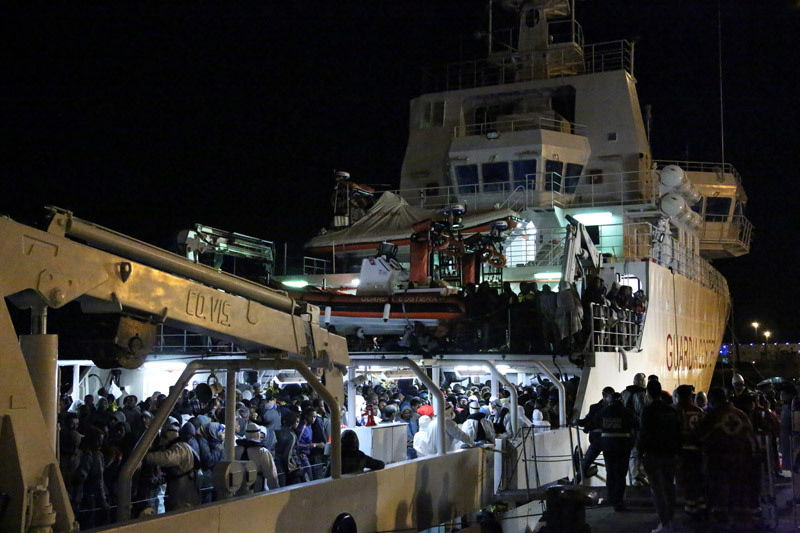 According to Flavio di Giacomo, IOM spokesperson in Italy, the Italian Coast Guard has indicated that the operation will continue for as long as it was possible to find survivors as sea conditions were not as bad compared to recent months. “Private cargo ships and other vessels in the area have also been asked to provide support,” he added. If the numbers are confirmed this would bring the death toll to over 1,500 migrants who have drowned in the waters between Libya and Italy since the start of the year, with over 1,100 in the past week alone. Already, in the past several days alone, more than 10,000 have been rescued by Italy's coastguard and other boats. Survivors of this latest tragedy are expected to be taken to Catania (Sicily), where IOM staff is on hand to provide necessary support and assistance alongside the Italian authorities. This latest tragedy comes as landings of rescued migrants surge in Southern Italy and IOM teams were still gathering evidence of the 400 presumed fatalities, earlier last week. As they have done with this latest tragedy, Italian maritime forces had carried out rescue operation of migrants in distress on the Mediterranean Sea late last week and into the weekend with landings recorded at the ports of Augusta and Trapani, where Italian authorities brought 600 and 580 migrants, respectively by Friday (17 April). As of Thursday 16 April, the Italian Coast Guard, the Italian Navy and several commercial ships had come to the rescue of approximately 10,000 migrants in the six days since Friday 10 April; as of Friday, 17 April, the total number of migrants reaching the Italian coasts is 21,191 since 1 January 2015, according to IOM’s estimates. However that does not include other search and rescue operations carried out yesterday and last night, whose survivors are expected to land in Italy later today. In the earlier tragedy at the beginning of last week, IOM reported that around 400 migrants lost their lives at sea when a wooden fishing boat carrying about 550 people capsized. Survivors of the shipwreck had told IOM staff that men on deck had become restless and started moving about when they saw a rescue boat approaching them. An estimated third of the passengers on board were women and children who, at the moment of the shipwreck, were staying in the hull of the boat to be better protected from the cold. When the boat capsized, the hull was flooded with water and it is presumed that they all died. Additionally, it was reported that a fight broke out on one of the boats rescued some days ago (whose passengers reached Palermo on Wednesday 15 April) and 3 Nigerians and 6 Ghanaians were thrown overboard. The incident was brought to the notice of the local police, who arrested 15 individuals. Furthermore, among the 586 migrants landing in Trapani Thursday, there were 4 individuals (2 from Nigeria, one each from Ghana and Niger) who had identified themselves as the sole survivors of a shipwreck with 41 casualties. Those 41 migrants are believed to all be men from Sub-Saharan Africa. 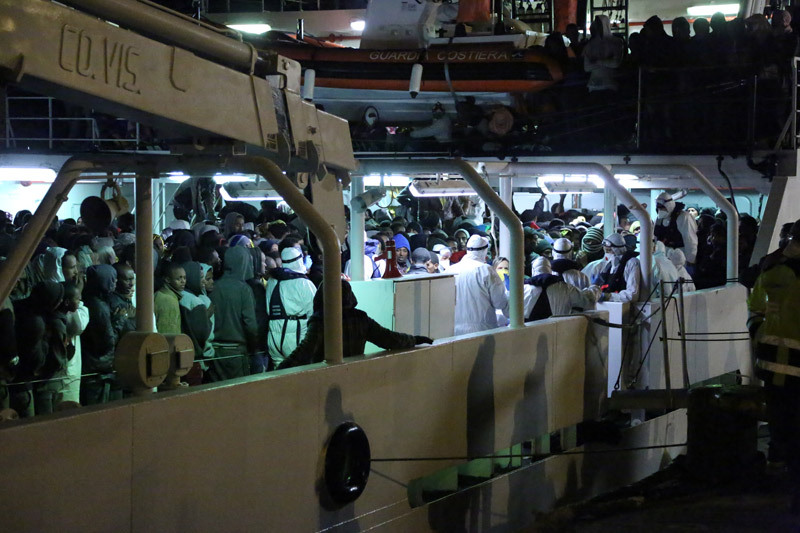 IOM had learned that the four were found floating in the sea, spotted by a helicopter, and were then rescued by an Italian naval vessel – the Foscari. They left Tripoli on Saturday and had been adrift for four days. With these latest tragedies, the death toll for 2015 will be well over 1500, compared with 96 during the first four months of last year – marking a shocking increase. IOM staff continues to be deployed at the main landing points – alongside UNHCR, Save the Children and the Italian Red Cross – in the framework of the EU and Italian-funded Praesidium project. The project provides legal assistance to those arriving by sea, monitors the reception conditions and supports the authorities in the identification of vulnerable groups persons including trafficked women and children without parents.